I should have realized that when a film like Out of the Furnace, with the sort of high profile starry cast that it has, flew under my radar for so long, it might not have been a good sign. It’s got some impressive names on its IMDB page, from Scott Cooper, whose first film (Crazy Heart) won Jeff Bridges his Oscar, to the murderer’s row cast of Christian Bale, Casey Affleck, Forest Whitaker, Woody Harrleson, Zoe Saldana, Willem DaFoe and Sam Shepard. They’ve come together to tell a story of two brothers in western Pennsylvania just trying to scrape by in an unfeeling world. Christian Bale’s Russell works in a steel mill and has a bit of a drinking problem, and his brother Rodney (Casey Affleck) is an Iraq war veteran with PTSD who struggles to get by after he was spit out by the American war machine at the end of his fourth tour of duty. All these boys want to do is live their lives without too much interruption. This, of course, is not meant to be. Russell gets locked up for drunk driving, and isn’t around to be a positive presence in Rodney’s life. Rodney ends up slipping into debt and becoming a street fighter to break even with his patron John Petty, played by Willem Dafoe. Dafoe himself is beholden to a sociopathic drug addict/dealer named Harlan DeGroat (Woody Harrelson). Meanwhile, Russell’s girlfriend (Zoe Saldana) abandons him during his time in jail, falling into the arms of a local cop (Forest Whitaker), and Rodney and John decide to venture out to New Jersey to settle up accounts with DeGroat. 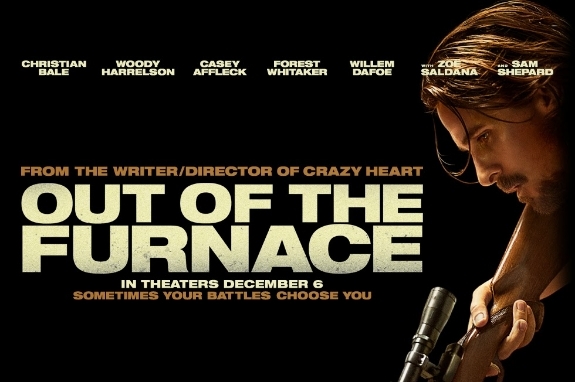 There’s quite a bit of plot in Out of the Furnace. It’s clear that Cooper and co-writer Brad Ingelsby were striving for an epic story about the little guy slipping through the cracks in this depressed society. There are times they try to sync this up with the real world (there’s a pointed Barack Obama reference that sticks out like a sore thumb early on in the film), but it’s not something they stick to as a fully thematized reflection of the plot (as was done in last year’s Killing Them Softly). This weird half-measure is symptomatic of the problems the entire film has: nothing resonates. The actors are, unsurprisingly, up to whatever task they could be given, but the task they receive here is paper thin, inconsistent and lacking any interest. Take, as an example, Sam Shepard. He’s reduced to window dressing, a sidekick of Russell who tags along with him as he attempts to find his brother, and literally does nothing of substance. One could argue that it might be unfair to belittle the character in such a way simply because it happened to be overcasted, but no matter who played the role of Uncle Red, it still would have been a character that didn’t need to be there. It’s just more of an insult that Sam Shepard was just standing in the background of scenes doing nothing. Every character is drawn in absurdly broad stokes, forcing the actors into their own special little corners in an attempt to give us some sense of characterization. Harrelson goes off the deep end into full demon mode (more intense even than Natural Born Killers), and while he has the most charisma and is owner of likely the best performance of the film, it’s all in service of a vacuous black hat who doesn’t feel like an actual character from a storyline or script perspective, but is instead simply a cipher for violence and a foil for the film to latch onto. It’s not necessarily a bad thing to have an underdeveloped “faceless” evil as your villain, but it becomes a problem if your film is constantly striving to be more, something bigger, and constantly fails to live up to its own lofty expectations of itself. Cooper wants to provide parallels: between the real world and this fictional one, between the plight of brothers, between the actions taken out by one character at the same time seemingly unrelated actions are taken out by another at the same time, between the depressed manufacturing industry and how it affects those towns built up around it. He does all of this with the style and grace of a rampaging bear, deciding to juxtapose Russell hunting for deer with one of Rodney’s street fights because, well, because they’re both bloody, I guess? These messages and metaphors are so numerous and so mixed that the narrative begins to become confused in the sense that you can’t figure out what Cooper is trying to get at. The characters are lost and bogged down by these decisions, and the entire affair nearly takes on an air of parody. Out of the Furnace wants something elegiac. A grand, sweeping story about what happens to those people who get swept to the side by society and what they must do both to survive and feel like their lives have meaning in even some small way. This could have easily been a nice, taut small scale revenge/mystery film about a man trying to save his brother from getting in over his head with some nasty folks. Sure, it’s a film and a plot we’ve seen before, but a cast like this could have made that interesting. Instead, Cooper goes in the opposite direction, shooting for the sort of scale akin to Derek Cianfrance’s The Place Beyond the Pines from earlier this year, attempting to weave a tale that crosses boundaries and exists on a scale bigger than its conventions. But it doesn’t. All we get in the end is a tonally confused overwrought mess.